It is an undisputed fact that facial hair looks good on men. However, if they are not taken care of or trimmed properly, they will be totally disappointing. Beards and mustaches need to be trimmed from time to time. If you are looking for the right kind of trimmer to shave your facial hair, we have the right product for you. Do not hesitate or have any kind of dilemma since this product has been used by many people and recommended a lot. 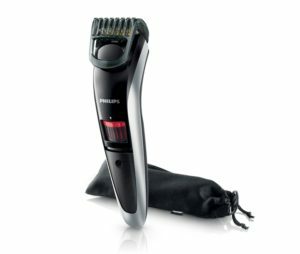 Here, we will provide you with the beard trimmer review of Philips QT4013/23 Trimmer which has become quite popular in the market and is now available on Amazon. This is one of the top of the line beard trimmer’s out there. This article will put up all the features, advantages as well as disadvantages of buying this product. This trimmer will help you to maintain a 3-day old beard easily. It is designed in such a way that it will be very easy to sport stubble. You can easily style facial hair which is 0.5 mm to 0.10 mm. You can get whatever style you wish for. The trimmer will function properly with cordless power for 30 minutes. But for that, you have to charge the battery fully for 1 hour. You can read the indications of the battery and act accordingly- it will turn green when the battery is charged fully, will be orange when the battery is low, and lastly it will blink green when you are charging the battery. The head can be detached easily and cleaned. The product is accompanied with a 3 pin UK plug. The trimmer is very easy to hold and you can trim the areas which are otherwise hard to reach. The trimmer has rounded tips which will be friendly to your skin and will not produce skin irritation. The blades are coated with Titanium and are of the best quality. You can turn the wheel and then select the lock-in settings that you wish to use. The trimmer never slips out of the hand and has an excellent grip. The blades remain just as sharp even after repeated usages for many years. All of the parts of the trimmer are waterproof and can be cleaned conveniently. Some customers have said that the blade guards are not so strong and can be prone to flexing. Some have found it a bit too costly. After going through different sites, we have found that the trimmer has got 4.3 stars out of 5. Most of them are highly satisfied with the product, though a few of them had a few complaints. Since the product has been known to deliver the best performance, a few drawbacks are negligible. 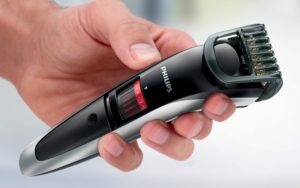 We suggest you highly to purchase Philips QT4013/23 Series Beard Trimmer and enjoy a good shave!